Just five years ago, the state of Georgia allowed undocumented residents to receive the same tuition subsidies (a waiver for “in-state tuition”) that any other state resident would receive to pursue a degree at a public university. While it was never easy for undocumented residents to afford even the reduced tuition (to say nothing about the cost of books, fees, and time off from work), it has now become almost impossible to attend school after a series of recent decisions by the Georgia Board of Regents. The Regents, who govern the 35 campus University System of Georgia, stripped away the waivers from undocumented students in 2007 and banned undocumented students from admission to the top research universities in 2010. Among the reasons were pressure from anti-immigrant groups based in the suburbs of Atlanta and stated concern for “legal” students, whose chances of attending were also rapidly diminishing due to Regents-approved tuition and fee hikes. 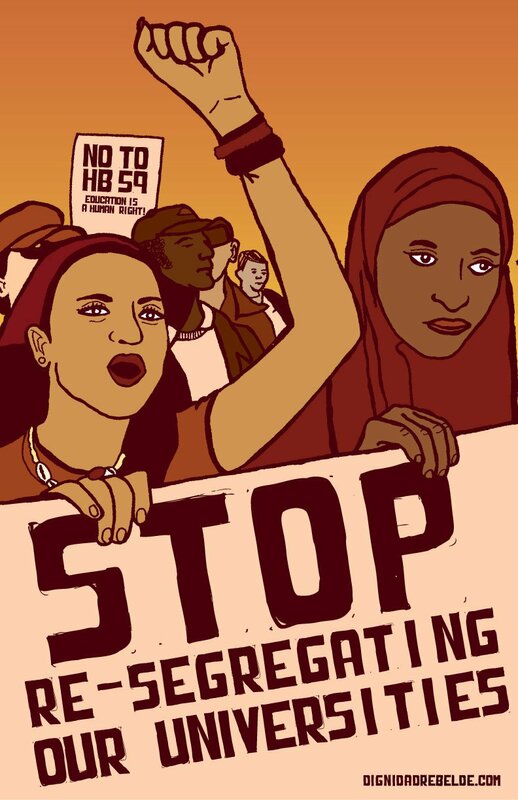 Following the Regents ban (limited to research universities) was the introduction of House Bill 59, which would exclude undocumented students from all public universities in the state (as of October 2011, it has still not come to vote). Months later, the governor signed HB 87, a bill modeled after Arizona’s anti-immigrant SB 1070. The move to exclude undocumented students from state universities sparked conventional protests (press conferences, demonstrations, banner drops, and civil disobedience) as well as new alliances between groups fighting budget cuts to higher education and those fighting for the DREAM Act–alliances that are perhaps not conventional enough. It also sparked a project called Freedom University in Athens, GA.
Let’s start with the moment that the Georgia Board of Regents passed their most recent measure excluding all undocumented students from the top research universities in the state. Can you describe the conversations or debates that led to the idea of the Freedom University and what sort of groups took initiative in that development? Juan Carlos: In March, Georgia Students for Public Higher Education (GSPHE), with the support of members of what would become the Georgia Undocumented Youth Alliance (GUYA), disrupted the Board of Regents three times–once to call attention to its ban of undocumented students, the second time to call on the Regents to wake up to the fact that Arizona copycat HB 87 was set to pass in the state legislature, and a third time to demand a tuition freeze, especially as the HOPE scholarship was radically restructured that very same day in the legislature. On April 5, six undocumented students were arrested in an act of civil disobedience. Their demand: for the Board of Regents to lift its ban of undocumented students. The photos from that demonstration are breathtaking and, at least for me individually, confirmed to me how urgent the discrimination and shutting out of undocumented people from the state is. It’s from that resistive energy that Freedom University (FU) was born. 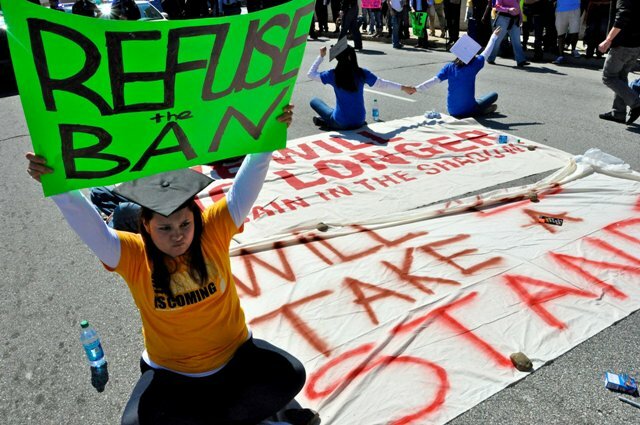 Undocumented students participate in a civil disobedience action near Georgia State University in Atlanta on April 5, 2011. Photo credit: Caitie Elle. Claire: Freedom University did generally come out of that resistive energy, but I specifically remember that back in May, Andrew invited me to a meeting for members of the academic community who wanted to do something about the recent legislation and the ban on undocumented students. I had participated in GSPHE and GUYA rallies up to that point, but I remember being disappointed at the lack of public response at that time from many of my fellow students and professors. So I was excited to attend that meeting, and I think that’s where the specific idea for Freedom University was born. It was one of those moments where I marveled at the life-affirming creativity that can come out of righteous anger–Freedom University, what a great idea! I never would have come up with that on my own, but someone had the idea and we all took it and rolled with it. Andrew: I remember stewing at the silence of the academic community at UGA [University of Georgia, located in Athens, GA]–particularly the History Department where I’m a grad student–in the face of these re-segregation policies. So I typed up a fiery e-mail and sent it off to a few professors and students. Most ignored it, others attacked it, but a handful of righteous folks gathered one afternoon in Athens to plot a response. My not-so-radical imagination was limited to a strongly worded petition, but like Claire said, someone just came out with this brilliant idea — Freedom University. It captured the best traditions of popular education, on-the-ground organizing, and steadfast non-compliance with unjust laws. Allie: Right, I think Juan Carlos really identifies the resistance which inspired Freedom University organizers to take action, while Claire and Andrew describe the unnerving silence in the academic community which made FU all the more necessary. The fact that UGA celebrated the 50th anniversary of its own desegregation the very same year that it was drastically re-segregated–by the ban, HOPE cuts, and tuition/fee hikes–only further necessitated a collective response from the UGA community. Burnt out on organizing at UGA amongst the “good ol’ boys,” I remember being skeptical that this effort would ever really take shape, given that I caught wind of the initiative at the tail end of spring semester. But while summer would normally be the death of any productive campus organizing, the rage of Georgia’s immigrant community in response to unyielding attacks kept UGA and Athens organizers accountable. The perseverance of undocumented Georgians and GUYAs standard for heroic direct action, when paired with the efforts of Athens organizing strongholds like the Athens Immigrant Rights Coalition and the Economic Justice Coalition, were a perfect storm (pardon the cliche) for resistance. 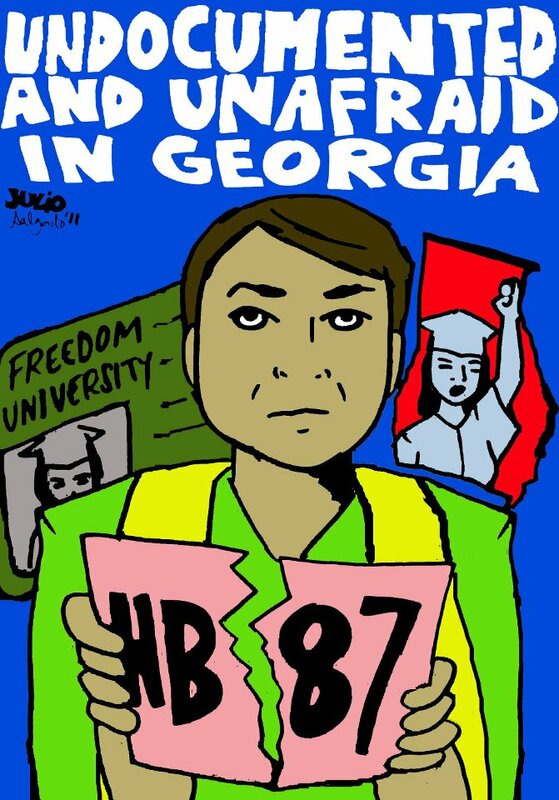 By July 2nd, when more than 10,000 took to the streets to protest Georgia’s “hate bill 87,” there was no longer a doubt in my mind that FU would come into existence. Many folks on the left hear “Freedom University” and think of the Mississippi Freedom Schools of 1964 and maybe other radical or labor-oriented education initiatives like the Highlander Folk School. Do you think of the Freedom University in the same way or is this a different type of initiative? Juan Carlos: We’ve totally appropriated the word “freedom” to evoke our geographic connection to the Black Freedom Movement of the 1950s and 1960s. In our marches and demonstrations we’ve participated in with GUYA and against HB 87, some of our most inciting, inspiring speakers have been Black civic leaders like the Rep. John Lewis and Iconium Baptist Church pastor Tim McDonald. At UGA, our rallies are always at the historic Arch, which is of course where Charlayne Hunter-Gault and Hamilton E. Holmes walked to register for classes. 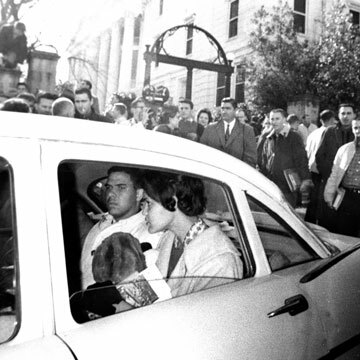 Charlayne Hunter and Hamilton Holmes arrive at the Arch, January 9, 1961. They were the first African-American students allowed to register for classes at UGA. In terms of Freedom University itself, if you look at the syllabus, the readings are by some of the most important, critical thinkers on U.S. history–what’s most exciting for me is the unit on “Interprellating History: Memory, Orality, and Cultural Productions of Resistance.” Students are going to be reading Junot Díaz’ The Brief Wondrous Life of Oscar Wao and Piri Thomas’ Down These Mean Streets, to name a few. These works radically redefine what it means to be American. They speak directly to the colonialism–and struggles against and in it–that founded this country. This inaugural course, innocuously called “American Civilization I,” is not just another class to help students find a job. It’s about all the identities students will be bringing into the classroom, the identities of their families, and conceiving ourselves as revolutionaries. Andrew: Juan’s answer is right on. I’d just like to add that Staughton Lynd, who served as director of the Freedom Schools in the Mississippi Summer Project of 1964, is on our National Board of Advisers, so the Civil Rights connection is more than just rhetorical. Are there any tensions or challenges in attempting to offer something very similar to what students would experience in some of the most selective universities as well as something that’s very political by nature? Juan Carlos: We have had to be astute about what circles we promote Freedom University in. In a way, this initiative is a political statement against the Board of Regents’ ban, and the University of Georgia’s complicity with the ban on a general level. But I think there is a clear understanding on the part of the students that higher education is not about getting a job and securing elite economic status, but rather about transforming the world. It’s about skills to build power. Many students taking the class probably heard about the class in activist circles. Claire: Just to add to Juan Carlos’ comment on students hearing about the class in activist circles – one student I talked with at the first class this weekend told me he learned about the class through several UGA first year students with whom he went to high school. I think this indicates that our outreach has actually gone beyond those activist circles. To answer the question, I think those tensions certainly have the potential to be present, but that they’ve been dealt with very well by FU organizers. I think this is because we have always put the students’ needs first and recognized that FU is for them, and have been guided by that general principle. An example of a question that came up in the spring is should we try to hold classes on UGA campus as a big political statement, and one that probably would have caused a lot of ruckus? We decided not to because we wanted students to feel like they could learn in a safe space. Andrew: In some ways this tension is less acute in Freedom University than in a rigid institution like a public university or high school. We’re upfront with our conviction that higher education can be both intellectually rigorous and politically relevant, and thus we sidestep the subtle (and sometimes not-so-subtle) censorship that marginalizes politicized educators in more “legitimate” bodies. Allie: I completely agree with the above. We’ve clearly promoted this effort as a response to the ban on undocumented students, so there generally hasn’t been a need to censor FU’s political nature–though we’ve left the website a little ambiguous as to avoid unnecessary confrontation. Claire is right, though, in that we prioritize the students’ needs over our own activist agendas. There certainly have been tensions, but generally to the tune of how do we prevent Freedom University from becoming a non-profit organization that is more preoccupied with its own existence and services than with the fact that it was created as a means to an end? Thankfully, students, faculty and organizers seem to be in consensus that what classes we do offer will be the best damn classes we can make them and that the ultimate goal of FU is to no longer need FU. What sort of things were being considered when organizers of the project were developing a curriculum and application process? Juan Carlos: The professors have been really in the forefront of organizing. In conceiving “American Civilization I,” they wanted a course that could easily fulfill an Intro to U.S. History or English 101 requirement at any institution. It’s a survey course. Claire: I know the professors wanted to emphasize that this is a rigorous university level course. And it definitely is rigorous! They have some kind of writing assignment for each week of class, including several longer papers, and plenty of reading. I’m a graduate student, and I was a little intimidated by the 15-page syllabus! But one of the professors said she’s never seen students so excited about such challenging work. It’s absolutely not what UGA students might call an “easy A” class, and that was a major goal in developing the curriculum. Andrew: Like Claire and Juan said, it’s important to emphasize how rigorous this course is. But it’s also a syllabus developed by the professors to be relevant to the lives of our students. “American Civilization” can mean a number of things, many of them disempowering and exclusionary. This course opens up the traditional, often whitewashed boundaries of “American” to reckon with all the complexities of colonialism, power, and resistance. Allie: And in the same way that the course was designed not to be exclusionary, so was the application process. While we were clear from the get-go that this course was created as an alternative for students who had been shut out of higher education, whether by the ban or the rising costs of tuition, we insisted that no one be denied admission. The majority of students are undocumented or face some other clear barrier to affording/accessing higher education, but this is not true in every case. Some students are simply on-board because they want to continue their education outside of the hyper-corporatized, neoliberal, public or private university system. 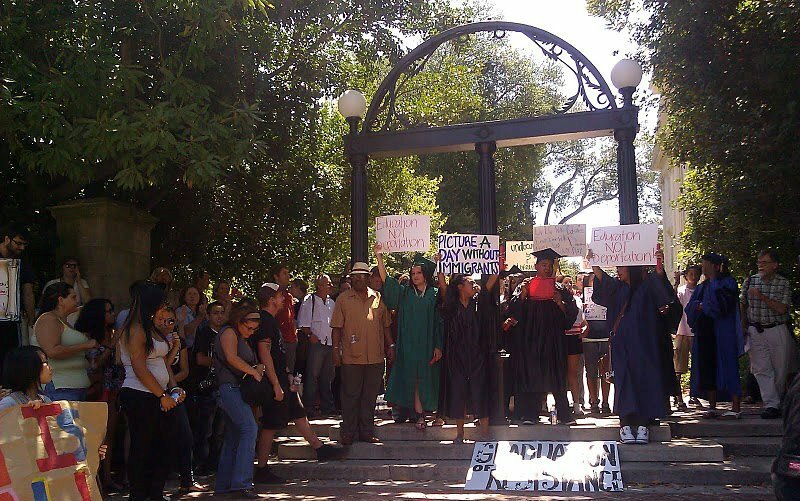 The Georgia Undocumented Youth Alliance and allies host a “Graduation of Resistance” at the UGA Arch. Photo credit: GUYA. With all of the dramatic budget cuts and tuition hikes hitting campuses everywhere right now, is it possible to have an “accessible” university education even without the ban on undocumented students? Juan Carlos: That’s the funny and ridiculous thing. The Board of Regents found that 501 out of 310,000 students in the whole University System of Georgia are undocumented. Something like 30 Latin@ students applied to the University of Georgia last Fall. It’s not like Latin@ students are applying in droves to the state’s top five institutions…if only. Economically, public higher education is very inaccessible, and it is only getting more inaccessible. We also have to look at the school systems undocumented and Latin@ students are coming from. Many times, they may not even be encouraged to go to college–again, that’s the educational double-standard that’s thrown against many students of color from the time they’re in elementary school. The Board of Regents ban only puts into official policy an injustice that was already being perpetrated by the educational system and a society that puts white over black, brown, and poor yellow. Claire: In short, no, I don’t think it’s possible to have an accessible public university with dramatic budget cuts and tuition hikes. This is something that FU and related groups like Georgia Students for Public Higher Education (which many of us are involved in) have long recognized. The struggle is much broader. In my opinion, one of the most pervasive problems is the ideology around austerity that seems so dominant right now–the idea that fee hikes are just inevitable in a bad economy. So raises in tuition are “inevitable,” but Michael Adams (the President of UGA) got a $50,000 raise this year which, incidentally, came out of a diversity scholarship fund! There are alternatives, and I think more and more people are starting to see that. Freedom University is an example of a vision of what accessible public education could look like. Andrew: One thing we don’t want to do is imply that the Board of Regents ban is the only obstacle to universal accessibility. The University System of Georgia, like so many other states in the nation, has been subjected to a withering assault of budget cuts and tuition hikes; the Trojan Horses of privatization. At the University of Georgia, it’s ushering in a slow return to the ugly past, when the gates were open only to middle and upper class whites. That’s why Freedom University is open not just to undocumented students but anyone who’s been affected by cuts to HOPE and tuition/fee increases. Allie: Right, something is clearly wrong with public higher education. There is very little that is “public” about it, other than ever-diminishing amounts of state funding. There needs to be a radical transformation in higher education in order for it be anything close to “accessible” (the same could be said about access to quality, public K-12 education). The current academic capitalists shaping education policy seem to have little interest in the “public good,” unless it’s for job training. Could you share some of your basic goals as well as long-term vision for the project with readers? Juan Carlos: The basic goal of Freedom University is to provide courses identical to those taught at the state’s most prestigious universities for undocumented students and students who have been shut out because they can’t afford the alarmingly high cost of public higher education in Georgia. Another goal is to provide students the experience of being in a college classroom, where critical thinking and their individual voices will be valued. Freedom University professors and organizers want undocumented students to have access to the networks of higher education in the United States and abroad. Ideally, as the semesters go on, more and more professors will participate in the project, teaching a wider variety of courses to undocumented and poor students. Claire: I think one basic long- and short-term goal is to challenge the hierarchies that make access to education so unequal in very racialized ways. We want to end the ban on undocumented students from the top public Georgia universities–that is a critical and fundamental goal of FU. But we realize there are these larger structural inequalities that prevent students from accessing public higher education, and we want to chip away at those through our work and through pedagogy. Andrew: There’s an interesting tension here. On the one hand, I want to demonstrate that a community can come together on the basis of human solidarity and create sophisticated, democratic structures of mutual aid without corporate or state backing. On the other hand, we want the state of Georgia to wise up, to open the doors of higher education so that projects like Freedom University aren’t necessary. That’s why we’re going to provide high quality, empowering education but also not let up on the state until they change their ways. Allie: I agree with what everyone else said and just want to add that on a more basic, Freire-esque level, we want our students to participate in their own liberation. Finally, how can people help this initiative succeed and what advice would you give to anyone looking to follow in your footsteps? Juan Carlos: Simply spreading the word is key. Buzz is key. I was down at the Coalition of Immokalee Workers’ annual Fair Food Summit a few weeks ago, and there were people there who knew about Freedom U.! It was so exciting. Donate money and books. If you’re a college student, push faculty to sign on to petitions, to get involved, to make a statement. Also, embrace how messy and conflict-ridden organizing can be sometimes. Claire: Yes, please spread the word and donate money and books! Also, if you think you have some insight into the accreditation process, get in touch with us. Accreditation has proven to be a lengthy process, but it’s very important to us. We want the students to earn college credit for their work, and also to send a clear message to the Board of Regents that the wider academic community does not agree with their actions. Andrew: I’ll add only one thing to the useful suggestions offered by Juan and Claire. To our friends in Arizona, Alabama, and any other state, city or town targeting immigrant communities with segregation laws and policies, start your own Freedom University. Since editing this interview, we’ve received news that the UGA Franklin College Faculty Senate has voted unanimously to urge the Board of Regents to rescind the ban on undocumented students at UGA and other Georgia universities. Freedom University classes have also officially begun! Please consider checking out the FU wish list and helping them get all the materials they need for classes. Stay tuned to the Solidarity Webzine for more in-depth interviews, discussions, and reports coming up soon! Juan Carlos Cardoza-Oquendo was raised in Atlanta, mecca of the Civil Rights Movement, by Puerto Rican parents. He is a fourth-year undergraduate majoring in Anthropology and Human Geography at the University of Georgia. Claire Bolton is a volunteer teaching assistant for Freedom University and a graduate student in geography. She once dreamed that she got a tattoo that said “FU” on her face–that’s how much Freedom University means to her. Andrew Epstein, a carpetbagger from New York, is a graduate student in History and Native American Studies at the University of Georgia, and has been involved in economic justice, prison solidarity, and anti-imperialist organizing for several years. Allie McCullen is a University of Georgia alumna and organizer with Georgia Students for Public Higher Education (GSPHE), a statewide coalition of students and allies who believe that affordable and accessible, quality higher education is a right. wouldn’t it be great if the OWS folks got behind this movement and ‘syndicated’ it throughout the country. It’s a tangible effort with real results, thus addressing the critics who say the movement is unfocused.